Northern California is currently battling the worst wildfire in the state’s history, the Mendocino Complex. 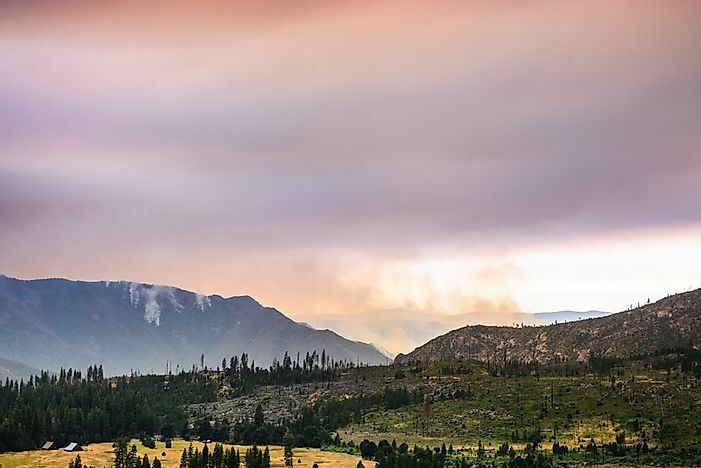 The Ferguson Fire is currently burning in Yosemite National Park. Photo credit: Shutterstock. California is currently experiencing the worst wildfire in its history. The fire, which is being called the Mendocino Complex Fire, consists of two fires called the Ranch and the River Fires, which are both raging around Clear Lake in Northern California. The fires started on July 27. The distance between the two fires is now less than 1.8 miles after they started on July 27. The fires have destroyed at about 443 square miles of land. Since August 3, the fires have grown by at least 80%. This means that the size of the inferno is larger than all of the boroughs of New York City. The fire is spreading quickly because of the hot and windy weather together with the dry vegetation. There is also another fire currently burning in remote areas of Yosemite National Park, which has been burning since July 13th. Firefighters have been working tirelessly to try to quell the blaze. The 3,900 fire crew members have resorted to containing the fires so that it does not spread to nearby areas. As of Monday evening, about 30% was contained. Unfortunately, at least 16 other major fires are also ravaging California. For example, the Carr Fire that started on July 23 after sparks from a tire-burst started a fire that killed seven and destroyed 226 square miles. Fortunately, no one has been hurt from the Mendocino Complex Fire. However, more than 80 residences have been burnt and thousands have been displaced. Unfortunately, two firefighters have been killed by the fire in Yosemite National Park. Eleven others were injured. What is the Likelihood of Another Fire? The chances of another fire are high considering that recent periods have seen many wildfires that have destroyed more than 1.5 million square miles of land in California. The most recent major fire was the Thomas fire of 2017 that destroyed around 440.5 square miles.